Iftari items along with snacks are contaminated with textile colours which are very harmful for health. The month of Ramadan is full of contradictions. It not only sees the Muslims in Bangladesh fast and pray more devoutly than any other month but also observes the steepest rise in the production and sales of adulterated food of all sorts which is considered a serious crime under the Pure Food Ordinance (1959). Existence of numerous government bodies under several ministries without any co-ordination has given the concerned officials the perfect opportunity to pass the buck. However, experts stress the need for forming a strong body that would coordinate as well as lead all other existing bodies to put an end to food adulteration before it goes out of control. 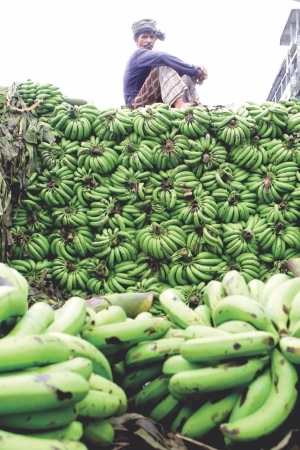 Calcium Carbide, a harmful adulterant, is sprayed over bananas, mangoes, papayas and pineapples, among other fruits, to quicken their ripening process. Chawkbazar, Dhaka. Five in the afternoon. Weaving his way through the thickly spotted, make-shift iftar shops flooded by fasting customers, Raihan moves ahead, holding his father's hand. They are heading towards Mannan Mia's shop, which is small yet overflowing with a bustle hitherto unknown to Raihan. His father, Kashem Siddique, is here to buy shahi kebab, jilapi, beguni and peyaju –items that are traditionally held as must-have foods for breaking the fast. As Siddique waits his turn, the little boy shifts his attention to the man rolling out the dough, then to the one pouring brownish thick dollops briskly into a giant frying pan. 'Peyaju', his father points out. The heady smell tickles even the most jaded appetite; leave alone the taste buds of a ten-year old. His eyes glisten as the smell sweeps the air. Once the items are bought, they rush back home. “I'm really short of time because on my way home, I'll have to pick up some fruits; nothing much, just some dates and bananas, may be some mangoes as well,” says Siddique. 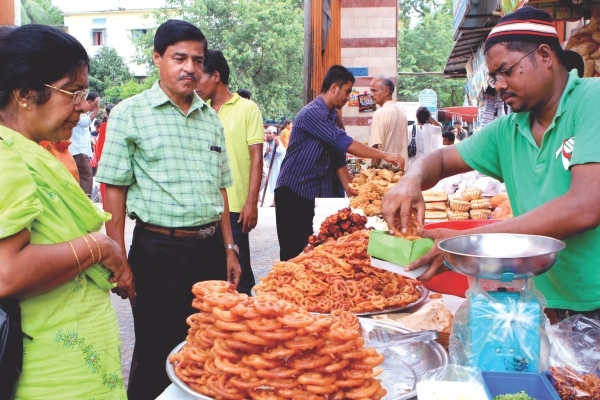 Raihan is not allowed to fast yet, but his most coveted time in the day during Ramadan is dusk when he gets the chance to gorge on the crispy peyaju and mouth-watering kebabs. He likes dates and mangoes too. Only he doesn't know a thing about the danger lurking beneath the camouflaging colours: bright brown potato chops or beguni, or gleaming red jilapi for that matter. The shiny surface of iftar items belie the deadly fact: textile colours are heavily mixed in all those items to give them a fresh look. What is worse, sometimes Mobil (used in vehicles and machinery) is added to make them crispier. “During a recent mobile court, we found several shops in different areas in Dhaka using Mobil in jilapi to make them crispier,” reveals Khalil Ahmed, a DCC (Dhaka City Corporation) magistrate. Besides, edible food colours are expensive while textile colours are available at very cheap rates, he adds. Textile colour is also used in many other items such as candy, chocolate, cake, chewing gum, ice cream, biscuit, chanachur, crisps and various colourful sweetmeats especially kalojam, chamcham etc.–favourites among children. Besides, these foods including the iftar items are produced in very unhygienic conditions. As a result, children are fast becoming the biggest victims of adulteration with textile colours. Imported fruits such as apples, grapes, dates and Sunkist navel oranges are more likely to contain formalin. Quazi Faruque, president of Consumers Association of Bangladesh (CAB), says that we are helpless consumers having no choice other than consuming foods contaminated with adulterants. “Let us begin with rice which is our staple food. Pesticides are sprayed indiscriminately in the paddy fields that are very harmful. Even after paddy is husked, chemical fertiliser urea is used to make rice whiter. Insecticides are used in a similar fashion in the production of vegetables which are also detrimental to health. 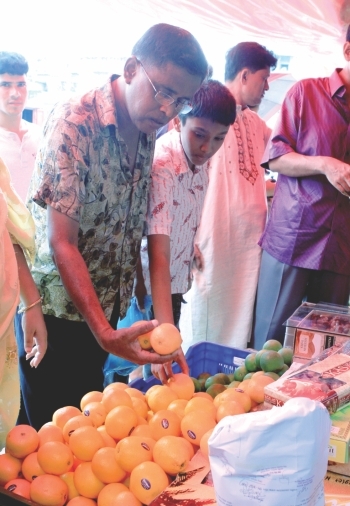 Likewise, most other food items especially fish and fruits are adulterated as many recent studies have shown,” he says. In this regard, ABM Farouque adds that hydrose is mixed in puffed rice and sugar to make them whiter and look fresh. It has been years since a number of studies conducted, among others, by the Institute of Public Health (IPH), Dhaka City Corporation and BSTI confirmed the alarming extent to which foods of all kinds were adulterated. 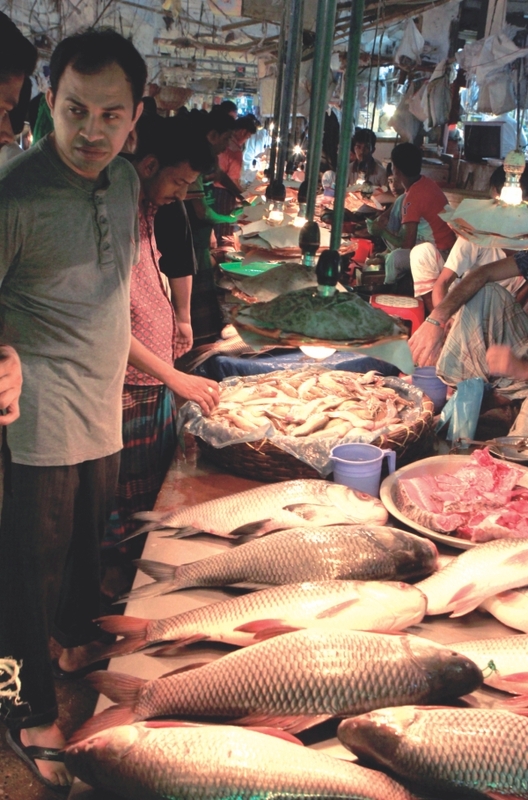 Numerous tests done by the Institute of Food and Nutrition (IFN) and the Department of Pharmacy at the University of Dhaka have also come up with identical findings. 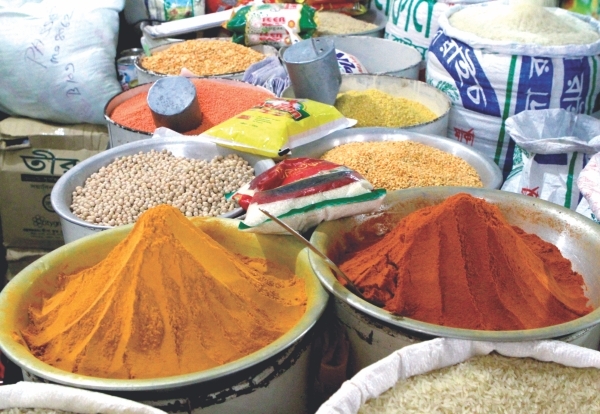 Notwithstanding such authentic proof of food adulteration, the government has only set up mobile courts, especially during Ramadan, conducted by several government wings including BSTI, DCC and Directorate of Consumers Rights Protection (DCRP) in association with metropolitan magistrates and law enforcing agencies. However, the sporadic nature of such uncoordinated as well as unplanned drives have done little to clip the wings of the adulterators. On the other hand, in the absence of a well-planned, continuous government monitoring cell, the ill-practice has kept up lifting the scale several notches up every year. 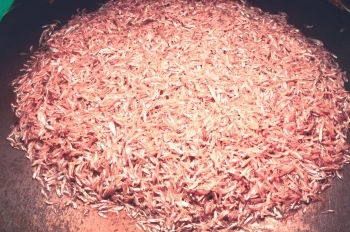 Kachki, along with other small fish, are dipped in formalin solution. Formalin, a mixture of formaldehyde and methanol, is a disinfectant and considered one of the most harmful adulterants. It is mainly needed in the plastic industry, but is also used to preserve dead bodies. However, in our kitchen markets most of the fish are dipped in the diluted solution of formalin. To make matters worse, sometimes the concentrated form of formalin is injected in the head of fish to make sure that it will not rot. Thankfully, our national fish Hilsha is not contaminated with formalin, ensures ABM Faroque. However, he informs that formalin is also used in milk, apples, grapes and dates. Children are the biggest victim of food adulteration. Calcium carbide is another adulterant which is sprayed over certain fruits to ripen them artificially as well as quickly. It is used mainly in pineapples, mangoes, papayas, bananas, and also in lychees and jackfruits in a lesser degree. Even spices are not free from adulterants. Most of the red chilli powder found in the market is mixed with brick dust. Fine sawdust is often mixed with cumin and other ground spices, say CAB members. Honey is also frequently adulterated, as lab tests have found sugar syrup often mixed in honey to enhance its sweetness. Nowadays, pure butter oil and ghee are also very rare in the market. Dishonest traders use a host of ingredients such as animal fat, palm oil, potato mash, and vegetable oil to produce fake butter oil. They even mix soap ingredients like steirian oil with ghee, to increase the quantity. Dalda, a vegetable based fat used for cooking is an example of one of the worst cases of adulteration. "Our stomach's temperature is 37 degree Celsius and the melting point of dalda is 54 degree Celsius. Thus there is no way that dalda can be absorbed by the body,' says Golam Mowla. Another adulterated food is condensed milk produced by Bangladeshi manufacturers, which contain little or no milk and is in fact condensed vegetable fat, says a source at BSTI. BSTI, an autonomous body operating under the Ministry of Industries, is the only National Standards body of Bangladesh that controls standardisation of manufactured products. Monitoring the quality of certain products is also within its ambit. BSTI Director Syed Humayun Kabir says that BSTI is mandated to monitor only 60 packaged items while about 80 other items remain outside its purview. So, he adds, other government bodies under the commerce, food and health ministries should work together to check adulteration. Brick dust is mixed with red chili powder and fine sawdust is often mixed with cumin and other ground spices. “Besides, BSTI has only 48 inspectors for a country of over 140 million. We have only 13 inspectors to prevent food contamination in Dhaka which is home to an estimated 13 million people. So we need more people to strengthen our monitoring activities,” he says. Asked about why the drives are conducted only during Ramadan, he says the body cannot conduct drives on its own for not having the power of magistracy. ABM Faroque says that bureaucratic red tape is a major obstacle to stopping adulteration. Yet, he believes that accountability in the government organisations can go a long way. “Formalin is imported in our country through the office of Chief Controller of Export and Import (CCEI). The CCEI office is supposed to keep records of how much is sold to different companies. Then the companies, plastic companies in most of the cases, sell it illegally to drug stores. So if the CCEI continuously monitors how the bought amount of formalin is used, I think any illegal trading of formalin can be stopped,” Faroque says. By the existing committee, he refers to the National Food Safety Advisory Council (NFSAC) established in 2005 under Bangladesh Pure Food Ordinance. This council operates under the Ministry of Local Government, Rural Development and Co-operatives. As it appears, there is no dearth of ministries and government bodies to stop food adulteration. In the midst of so many bodies, all the concerned parties have a chance to evade responsibilities by passing the buck. Against this backdrop, what we immediately need is the formation of a central committee or organisation to co-ordinate between as well as lead all the concerned parties. In addition, BSTI and DCC should be equipped with adequate manpower and modern instruments to make sure that they conduct anti-adulteration drives not just during Ramadan but throughout the year. 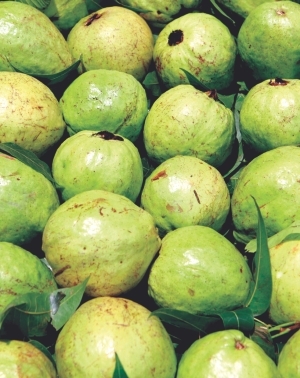 Fruits such as guavas, lemons and hog-plums (aamra) are still free from adulterants. Shahana Bilkis, a resident of Lalmatia, avoids going to the nearby Townhall market as much as possible; she rather enjoys taking the trouble of going all the way to Aati Bazar, Keraniganj to buy her daily necessaries. The ride, which does not take her more than 15 minutes or so, at times involves narrow streets with bumps taking a rambling course through a small township. Yet, the fresh vegetables picked directly from the fields and all the unadulterated dry items including lentils, pulses, chickpeas, red rice and various spices such as red chilli powder and turmeric produced mostly by local farmers bring a flash of smile on her face. “I know it's a bit troublesome for anyone from Dhaka to come to this place, but when you find out the vegetables were picked from the fields just hours ago, you'll feel all your little troubles are worth it,” she says. Despite all her awareness, is it possible to rid herself of the vicious cycle of food adulteration? “At some point, one is compelled to buy adulterated items. But if one is conscious, then the extent can be cut down to a minimal level,” says Shahana who is also assistant professor of a reputed college in the city. She suggests eating fish that remain alive at the time of selling, such as koi, shing and magur; fruits such as guava, lemon, and hog-plum (amra); and shunning fast food as well as anything bought from outside. a)	the sticky surface or clime of the fish’s body becomes dry, no matter how fresh it looks. b)	eyes of fish will be opaque whereas normally eyes are transparent. c)	fish or fruits will never attract flies. d)	fish will send out a pungent smell while chopping or taste bad after cooking. “Even after detecting formalin in fish or fruit, one can eat it after removing the skin. In case of fish, the head should also be avoided. However, such foods should not be repeatedly eaten,” says ABM Faroque.